We are the manufacturer and exporter of various model of high frequency plastic welding machines available in various out put power from 1 K.W. to 50 K.W. which can be classified as Manually Operated, Semi-Automatic Operated and Fully Automatic Operated. 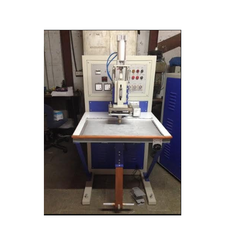 These machines are Pneumatic Driven or Hydraulic type and also available in custom built. These machines are also available in PLC with safety guard optional. We are offering the wide range of PU Leather, PVC Leather, EVA Embossing Machine. Jens Labels, Shoes Embossing, logos, etc. Looking for Auto Indexer Machines ?